Cook fettuccine as directed on package. Drain; return to saucepan. If necessary, cover to keep warm. Meanwhile, in small microwavable bowl, microwave meatballs, uncovered, on High 3 to 6 minutes, stirring once, until thoroughly heated. 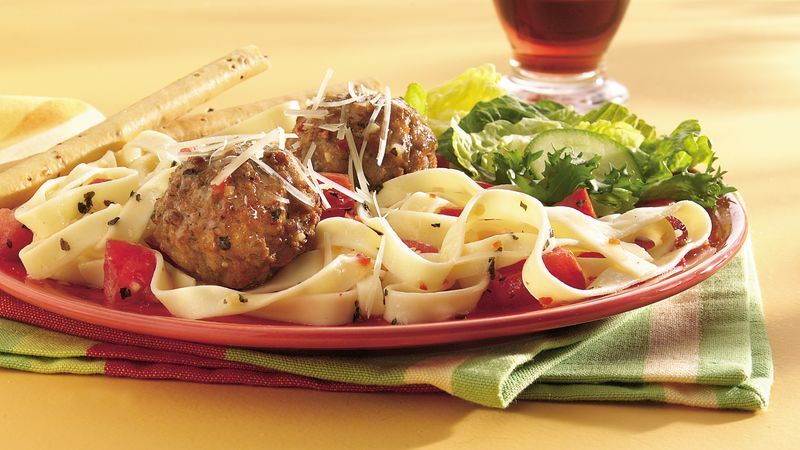 Gently stir meatballs, tomatoes, dressing and basil into cooked fettuccine. Cook over low heat 2 to 3 minutes, stirring occasionally, just until thoroughly heated. Sprinkle with cheese. You'll find a variety of sizes and flavors of meatballs in the freezer case at the grocery store. If the meatballs are small, you may need a few extra to equal the 8 ounces of meatballs needed for this recipe.